Andriy Zhylenko, CTO at PortaOne has delivered two very well received presentations this week at VON Conference & Expo 2009 in South Beach, FL this week. Andriy spoke about the challenges many carriers face on the international wholesale voice market. His second presentation named "From QoS to QoE: New Technologies for Testing IP Networks" was mainly focussed on how PortaOne customers use the PortaSwitch quality measurement tools. This was the first time PortaOne exhibited at a newly revived VON show. We have met with our Florida customers and partners and successfully introduced PortaOne solutions to many new carriers and service providers from across the US and Latin America. Mr. Zhylenko will share his extensive experience of participating at a international trade show at ISDEF Conference next week in Moscow, Russia. 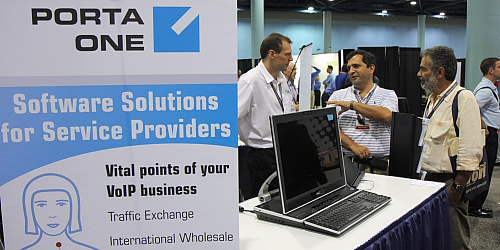 PortaOne will also exhibit at another major trade show this year: Gitex Business Solutions on October 18-22, 2009 in Dubai, UAE. Please meet PortaOne team in Dubai International Conference and Exhibition Centre, Hall 2, Canadian Pavilion, Booth A2-36.